Facts about Saucer Magnolia Tree, "Scientific name for Saucer Magnolia Tree is Magnolia x soulangeana" The Saucer Magnolia also known as Magnolia x soulangeana is a hybrid plant that belongs in the genus Magnolia. This deciduous tree in the family Magnoliaceae is mostly used in horticulture in east and west coasts of the United States as well as in the British Isles. A Full grown Saucer Magnolia Tree can absorb as much as 48 pounds (21.77 kg) of carbon dioxide a year. The same Saucer Magnolia Tree could also produce enough oxygen in a day for two people. In a single day, a large Saucer Magnolia Tree can drink up to 100 gallons (378.5 liter) of water from the ground and discharge it into the air. You can tell a Saucer Magnolia Trees age by the number of growth rings. Growth rings size shows what kind of conditions accrued that year, the temperature and if it was a dry or wet year. Bark of the Saucer Magnolia Tree protects it from the elements and is made up of dead cells. Tree roots usually grow two to three times the width of the Saucer Magnolia Tree branches. 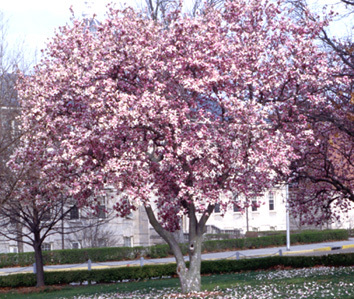 The ideal time to fertilize your Saucer Magnolia Tree is in late fall or early spring. If you want to transplant a tree do it in fall, this is ideal for most trees. Saucer Magnolia Tree is a deciduous tree that has large flowers in various shades of purple, white, magenta, burgundy and pink. It usually takes around 4 to 5 years for the first blooms to appear. Saucer Magnolia Tree witnesses early blooming which takes place between late March and early mid-April. After the blooming period, the foliage starts emerging. It is worth noting that flowers can bloom sporadically in late spring but the flowers are less colorful and less vigorous. It is a hybrid magnolia that typically rises to a height of 20 to 25 feet (6.09 to 7.62 meters) at full maturity. In terms of width, the Saucer Magnolia Tree has a spread of about 20 to 25 feet (6.09 to 7.62 meters). It has a rounded crown and often grown in a multi-trunked form. This hybrid magnolia Tree performs optimally in 4 to 9 planting zones. It is best grown in organically rich, moist and well-drained loams. This type of magnolia tree is intolerant to soil extremes as well as most urban pollutants. However, it is tolerant to clay soil. You should ensure that you grow the Saucer Magnolia Trees in a protected area because early spring frosts may cause damage to the flowers. Full sun to part shade is ideal for the growth of the Saucer Magnolia Trees. The Saucer Magnolia Tree is typically the most popular magnolia being cultivated today. It is an amazing specimen flowering trees that will spruce up your yards and lawns. The Saucer Magnolia Tree does not have serious disease or insect problems. Saucer Magnolia Trees make their own food from sunlight, carbon dioxide, water, and nutrients from the soil. Saucer Magnolia Tree leaves are made up of many colored pigments, green chlorophyll hides the colors during the growing season of spring and summer. As days get Shorter and cooler temperatures come in the fall, it cause the chlorophyll to break down and than the other color pigments can be seen. Saucer Magnolia Tree growth is referred to as Meristem (The undifferentiated embryonic plant tissue from which new cells are created, as that at the tip of a root or stem). This tissue can be found at the tips of shoots and leaves. Inside the stem growth in thickness occurs at the vascular cambium.